Our Java Programming Tests allow you to experience an online examination in the real-time environment. In every online test on Java Programming, you will be presented with Multiple Choice Questions (MCQs) which will test your skills in Java Programming Concepts in a detailed and comprehensive manner. In the test, each question will have 4 options to choose from. You should select only 1 correct option as an answer and then move on to the next question. Once you submit answers to all the questions, you will be given your final test score. In the Online Java Programming Test, for every correct answer, you will be given 2 points. There will also be negative marking of -1 for every wrong answer. So, you will have to be more careful in choosing the answers to the question in your online examination. If needed, you should skip to the next question and come back to the previous question later so that you can do proper time management for the online mock tests. 1. "Java Programming Practice Tests" - In Java Programming practice tests, there will be a series of practice tests wherein you can test your Java Programming concepts on every chapter separately. There will not be any time limit on these tests. So, Java Programming Practice Tests should be the first set of tests which you should attempt. Goto these practice tests here. 2. "Java Programming Mock Tests" - In Java Programming mock tests, there will be a series of mock tests wherein you can test your Java Programming concepts on every chapter separately, but there will be a fixed time limit per test. So, it is similar to Java Programming Practice Tests, but with an added constraint of time limits. 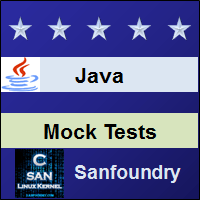 You should try Java Programming Mock Tests if you are appearing for any online examination soon. Goto these mock tests here. 3. 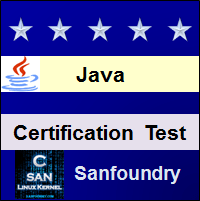 "Java Programming Certification Test" - Once you are through with your Java Programming concepts, then you should try our Java Programming Certification Test wherein Sanfoundry will issue a free Certificate to you if you scored either Grade A* or Grade A in Java Programming Certification Test. Goto Java Programming Certification test here. 4. "Java Programming Internship Test" - If you are interested to do Internships in Java Programming at Sanfoundry, then you must take our Java Programming Internship Test. If you scored either Grade A* or Grade A in Java Programming Internship Test, then you are eligible for Internship at Sanfoundry in Java Programming. Goto Java Programming Internship test here. 5. 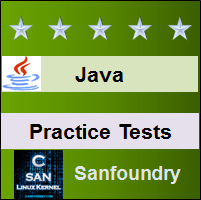 "Java Programming Job Test" - If you are a fresher, a dropout, an experienced person and if you know Java Programming well and looking out for jobs in Java Programming domain at Sanfoundry (or our Network of Companies), then you should try and qualify our "Java Programming Job Test". 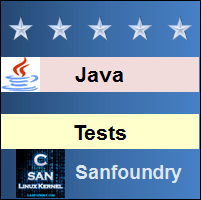 If you scored either Grade A* or Grade A in Java Programming Job Test, then you are eligible for a Job at Sanfoundry (or our Network) in Java Programming domain. Goto Java Programming Job test here. For every "Java Programming Practice Test", Total Questions: 20, Total Time: Unlimited. For every "Java Programming Mock Test", Total Questions: 20, Total Time: 20 Minutes. For "Java Programming Certification Test", Total Questions: 50, Total Time: 1 hour. For "Java Programming Internship Test", Total Questions: 50, Total Time: 1 hour. For "Java Programming Job Test", Total Questions: 50, Total Time: 1 hour. Before you get started on these series of online tests on Java Programming, you should learn, study and practice our collection of 1000 MCQs (Multiple Choice Questions and Answers) on Java Programming here. We also prefer that you should practice Java Programming practice tests and mock tests completely before attempting the certification test. Here is the list of online practice tests and mock tests on Java Programming. Each online test focuses on a "Specific chapter of Java Programming". So, you should try both practice test and mock test on every chapter to do a self-assessment of your knowledge (along with time-limit constraints) in every area or sub-topic of Java Programming. Java Programming Certification test, Internship test, and Job Test are mentioned at the end of this list. 1. Java Programming Test 1 – This set of online test on “Java” tests your skills on Integer and Floating Data Types, Character and Boolean Data Types, Data Type – Enums, Data Type – BigDecimal, Data Type – Date & TimeZone, Literals & Variables, Type Conversions, Promotions and Castings, Arrays, Data Structures – Arrays, Arithmetic Operators, Bitwise Operators, Relational Operators and Boolean Logic Operators, Assignment Operators and Operator Precedence, Control Statements – 1, Control Statements – 2. 2. Java Programming Test 2 – This set of online test on “Java” tests your skills on Concepts of OOPS, JDK, JRE, JIT & JVM, Class Fundamentals & Declaring objects, Introduction to Methods, Constructors & Garbage Collection, Constructors, Heap and Garbage Collection, Overloading Methods & Argument Passing, Access Control – 1, Access Control – 2, Arrays Revisited & Keyword static, String Class, Methods Taking Parameters, Command Line Arguments – 1, Command Line Arguments – 2. 3. Java Programming Test 3 – This set of online test on “Java” tests your skills on Recursion, Method Overriding, The Object Class, Inheritance – Abstract Class and Super, Inheritance – 1, Inheritance – 2, Searching & Modifying a String, String Handling Basics, Character Extraction, String Comparison, StringBuffer Class, StringBuffer Methods, Java.lang Introduction, Java.lang – Integer, Long And Character Wrappers, Java.lang – Void, Process and System Class. 4. Java Programming Test 4 – This set of online test on “Java” tests your skills on Java.lang – Object & Math Class, Java.lang – System Class Advance, Java.lang – Double & Float Wrappers, Java.io Introduction, Java.io Byte Streams, Java.io Character Streams, Memory Management, Java’s Built in Exceptions, Java.lang – Rounding Functions, Java.lang – Byte & Short Wrappers, Java.lang – Character Wrapper Advance, Java.lang – Boolean Wrapper Advance, Java.lang – Miscellaneous Math Methods & StrictMath Class, Java.lang – Runtime & ClassLoader Classes, java.lang – Class. 5. Java Programming Test 5 – This set of online test on “Java” tests your skills on Java.lang – ThreadGroup Class & Runnable Interface, Environment Properties, Serialization – 1, Serialization – 2, Serialization & Deserialization, Networking Basics, Networking – Server, Sockets & httpd Class, Networking – httpd.java Class, URL Class, HttpResponse & URLConnection Class, Networking – Datagrams, Java.util – ArrayList Class, Data Structures – HashMap, Data Structures – List. 6. Java Programming Test 6 – This set of online test on “Java” tests your skills on Data Structures – Set, Java.util – LinkedList, HashSet & TreeSet Class, Java.util – Maps, Java.util – Vectors & Stack, Java.util – Dictionary, Hashtable & Properties, Java.util – BitSet & Date class, Remote Method Invocation (RMI), Collection Framework Overview, Iterators, Data Structures – Queue, Java.util – Array Class, Collections Interface, Collection Algorithms, Exceptional Handling Basics. 7. Java Programming Test 7 – This set of online test on “Java” tests your skills on Exceptional Handling, Exceptions Types, Throw, Throws & Nested Try, Finally & Built in Exceptions, Try & Catch, Creating Exceptions, isAlive(), Join() & Thread Synchronization, Implementing Runnable Interface for Threads, Thread Class, Multithreading Basics, Multithreading, Creating Threads, Input & Output Basics, Reading Console Input. 8. Java Programming Test 8 – This set of online test on “Java” tests your skills on Writing Console Output, Reading & Writing Files, Applets Fundamentals, Text Formatting, Regular Expression, Event Handling Basics, ActionEvent & AdjustmentEvent Class, ComponentEvent, ContainerEvent & FocusEvent Class, MouseEvent, TextEvent & WindowEvent Class, Event Listeners Interfaces, Random Number, Locale & Random Classes, Observable & Timer Class, Packages. 9. Java Programming Test 9 – This set of online test on “Java” tests your skills on Interfaces – 1, Interfaces – 2, Core Java API Packages, Type Interface, JUnits, Java 8 Features, File and Directory, Hibernate, Liskovs Principle, Coding Best Practices, Generics, Generic Methods, Restrictions on Generics, Wildcards. 10. Java Programming Test 10 – This set of online test on “Java” tests your skills on Java Beans, JDBC, Design Patterns, Debugging in Eclipse, Web Application, Client and Server, Servlet, Session Management, JSP, JSP Elements, Reflection API, AutoCloseable, Closeable & Flushable Interfaces, Application Lifecycle – Ant, Maven and Jenkins, Annotations. 11. Java Programming Certification Test - This set of online free certification test on "Java Programming" tests your skills on all areas (all chapters, topics and subtopics) of Java Programming. 12. 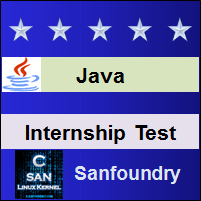 Java Programming Internship Test - If you scored either Grade A* or Grade A in our Java Programming Internship Test, then you can apply for Internship at Sanfoundry in Java Programming. 13. 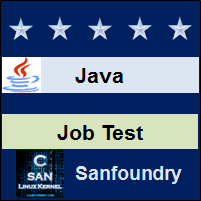 Java Programming Job Test - If you scored either Grade A* or Grade A in our Java Programming Job Test, then you can apply for Jobs at Sanfoundry in Java Programming domain. Best Wishes for your Java Programming Tests!